Potter College for Young Ladies was opened in Bowling Green on Vinegar Hill with Rev. B.F. Cabell as president. The college was named for it's major stock holder Pleasant J. Potter. Cabell built a large two-story home and a large three-story building that served as classroom space and dormitory. The curriculum included music, art, languages and elocution. 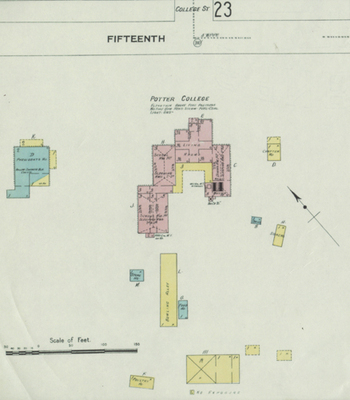 This is the 1909 Sanborn insurance map of the property, the year the college closed.